Hospital services are available 24/7. Emergency physicians on staff 24/7. 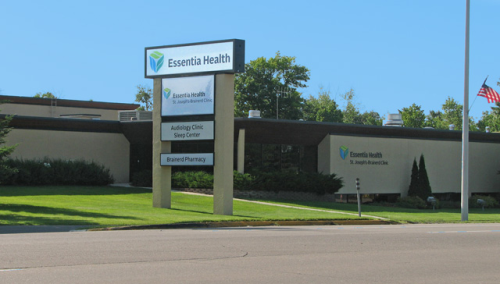 Essentia Health-St. Joseph's Medical Center is a 162-bed nonprofit community hospital located in Brainerd, Minnesota. More than 1,000 employees and more than 100 physicians representing 21 specialties make St. Joseph's the largest hospital in north-central Minnesota. As a Benedictine-sponsored Catholic organization, St. Joseph's adheres to the values of hospitality, stewardship, respect, justice, teamwork, and quality. Services include: Anesthesa, Birthing Center, Cancer Center, Cardiac Rehabilitation, Chemical Dependency, Chronic Pain, Colorectal Surgery, CT, Dietitian, Emergency Medicine, ENT Surgery, Geriatrics, Heart & Vascular Center, High-risk Obstetrics, Hospitalist Services, Infertility, Infusion Therapy (Chemotherapy), Joint Wellness Center (elective Knee and hip replacement), Lakeland Psychiatry Clinic, Mammography, Mental Health, MRI, Obstetrics, Occupational Therapy, Orthopedic Surgery, Pain Management, Pathology & Laboratory Medicine, Pediatrics, Physical Therapy, Podiatry Surgery, Pulmonary Rehabilitation, Radiology, Surgery, Trauma Surgery, Urology, Vascular Surgery, and Wound Clinic.